Shilpa Setia, a CSIR-senior research fellow, is currently working as a graduate student in the Department of Chemical Sciences, Indian Institute of Science Education and Research, Mohali, India under the supervision of Dr. Santanu Kumar Pal. She obtained her B.Sc. (H.S.) (2009) and M.Sc. (H.S.) (2011) in Chemistry from Panjab University, Chandigarh, Punjab, India. Her research area mainly focuses on design, synthesis and characterization of new discotic mesogens for opto-electronic applications. Columnar superstructures are widely appreciated for opto-electronic applications due to their high charge carrier mobility, self-healing of defects, defect free long range order, and tendency to form highly ordered films of various thicknesses etc. 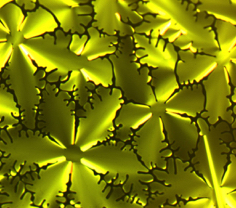 This optical micrograph represents the dendritic textures of approximate 6-fold symmetry that are consistent with a hexagonal columnar mesophase of a perylene-based discotic liquid crystal. The picture was taken on Nikon Eclipse LV100POL polarising microscope with a Linkam heating stage (LTS 420) using a Q-imaging camera and 20X objective. The sample was sandwiched between normal glass slide and cover-slip and the nucleation of dendritic growth was observed on slow cooling from the isotropic phase at 192.5°C. The width of image is about 500 µm. Jury comment: Christmas is coming! 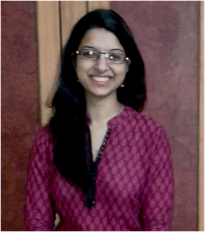 We would like to thank Shilpa for submitting her wonderful LC picture on time. Take a look, the texture is just like beautiful golden flowers and it is ready to celebrate Christmas. I believe that It will be a great cover story of a Christmas card. Merry Christmas to everyone, who works on the LC research.